We are a family company with over 40 years experience in moving peoples homes. We realise moving home and all your worldly possessions can be a very stressful and traumatic time and our aim is to make your moving experience as pleasant as possible. Our staff are professional and efficient, trained to BAR standards and all are experienced with some of our staff still with us after 25 years. They will ensure safe passage of your furniture to your new home whether it is just round the corner or 500 miles away. Our vehicles are high specification removal vehicles specially designed for the sole purpose of transporting your belongings safely. They are also fully equipped with covers, trolleys and cartons etc to enable us to move your belongings safely and efficiently. We have a range of vehicles from the large 18 tonners designed to move full family homes to the smaller Luton vans which are used to move single items, and smaller properties. Free delivery of packing materials for you to pack up your belongings prior to your move. Wardrobe cartons to move your hanging garments safely and crease free. Dismantling and re assembly of beds and free standing wardrobes. Specially designed suite/sofa covers to protect them from dirt or damage. Specially designed plasma/flat screen tv covers. Carpet and floor protection for your properties at both ends of the move. 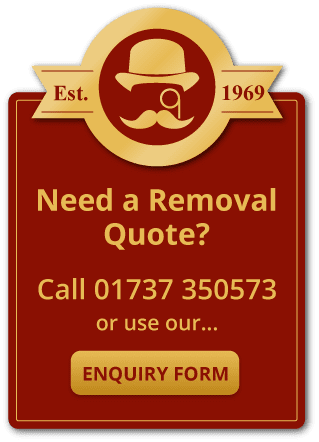 The first step you will need to take for your house move will be to contact us and make an appointment for one of our surveyors to visit your home for a free, no obligation survey. We can then assess your exact requirements in terms of size of vehicle(s), number of men, number of cartons, vehicle access and parking, distance, type of property etc so that we can plan and organise your move to make it run smoothly and also to work out your own personal quotation. We also offer other services to compliment your move such as full or part packing and storage etc. Please visit the relevant page for more detailed description.